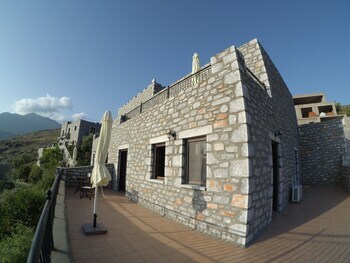 When you stay at Onar Mani Suites in East Mani, you'll be in the historical district and convenient to Kelefas Castle. Featured amenities include express check-in, express check-out, and luggage storage. Free self parking is available onsite. With a stay at Kalypso Hotel in Agios Nikolaos, you'll be near the beach, within a 10-minute drive of Spinalonga Castle and Plaka Beach. The front desk is staffed during limited hours. When you stay at Cavo D'Oro Apartments in Corfu, you'll be on the beach and 10 minutes by foot from Kavos Beach. Free self parking is available onsite. Located in Kos (Iraklides), Irene Studios is convenient to Mastichari Beach and Lido Waterpark. Free self parking is available onsite. With a stay at Exanthia Villas in Lefkada, you'll be 6.6 mi (10.6 km) from Milos Beach and 7 mi (11.3 km) from Kathisma Beach.